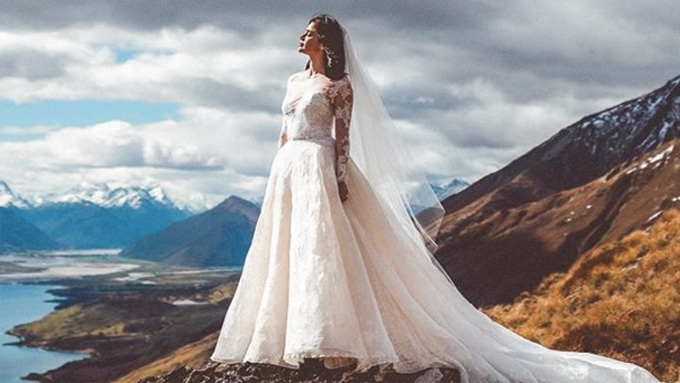 2017 was a year that gave us jaw-dropping and unconventional wedding gowns. There were celebrity brides who went bold in their choices and veered away from tradition, while others kept to the classics but put their personal touches to their bridal frocks. PEP.ph (Philippine Entertainment Portal) lists this year's wedding gowns that made a statement. The Kapuso actress married VJ Yambao on January 7, at Nayomi Sanctuary Resort in Batangas, wearing a custom two-way, embroidered, and beaded gown by Patricia Santos. Camille's serpentine-cut bridal dress hugged her curves perfectly, and two arm bands gave the illusion of an off-shoulder gown. The bride also walked down the aisle in a hand-beaded detachable train. The dusky beauty exchanged wedding vows with longtime beau Arthur Solinap on August 8 in Tagaytay. Rochelle wore a show-stopping Michael Cinco creation: a mermaid-cut monochromatic gown that featured a three-meter Spanish hand fan-inspired cape, which came studded with Swarovski crystals, micro beads, and pearls. Rochelle became the talk of the town with her gorgeous bridal dress, with Dubai magazine Emirates Woman calling it "Michael Cinco's most stunning dress yet." The curvy actress said "I do," to her Chinese-Filipino businessman fiancé Tom Yeung in an intimate ceremony in Boracay last March 3. Ehra wore a custom Patricia Santos creation: An A-line gown with layers of soft tulle and train. Its back was equally stunning, its intricate beading pattern extending to the gown's edges. The celebrated doctor to the stars wed her long-time partner Dr. Hayden Kho in a grand church wedding in Paris, France. Vicki and Hayden pulled out all the stops for the momentous occasion, including commissioning Dubai-based designer Michael Cinco, who came up with not one, not two, but four bridal gowns. Vicki only had to choose. She ended up wearing a blush pink, off-shoulder ball gown for her walk down the aisle. Michael described the extravagant frock as "made of French lace and tulle with full silk embroidery on top in baroque patterns with sequins, pearls and transparent and Rose Opal Swarovski crystals." The gown, with its three-meter train, took 1,000 hours to finish by 50 skilled artisans. The Kapuso actress got married to Pancho Magno at the Manila Marriott Hotel on December 11. Max looked immaculate in a custom Francis Libiran creation: a sleeveless, column embroidered, and beaded gown with an embellished neckline and an exaggerated train. The Kapuso actress broke tradition when she walked the aisle in a gray wedding gown to meet her groom Kean Cipriano at the altar last November 7. The dress designed by Edwin Tan featured white embellishments, and a cape with a dark-gray inner lining. The bride removed the cape after the ceremony and revealed a strapless bustier. The Comedy Queen was a picture of peace and happiness when she walked down the aisle to wed Gerald Sibayan at the Christ the King Church last December 12. Ai-Ai looked like royalty in her embroidered and beaded off-shoulder ball gown by Frederick Peralta, with a veil that director Louie Ignacio hand-painted with colorful floral appliqués. The Korean superstar married fellow Descendants of the Sun co-star Joong Ki on October 31 in Seoul, Korea. Hye Kyo glowed in her sophisticated silk Dior wedding gown. The actress was a vision of simplicity in an A-line gown with three-fourths sleeves and peek-a-boo lace square neckline. The beautiful wedding dress came with a handsome price, as Dior's haute-couture creations start at $30,000 or PHP1.5 million pesos. Because she used to attend events in white bridal gowns, Divine said she decided to skip the traditional traje de boda for her special day. She also refused to fit her bridal dress before her wedding day, reasoning that designer Rajo Laurel had already memorized her measurements. The host-blogger wed business man Blake Go, on August 4, in Cebu, wearing a gold bead-encrusted gown with a deep sweetheart neckline and a long train. No other wedding for 2017 was more talked-about than that of star Anne Curtis and entrepreneur Erwan Heussaff. From the reported November 11 date, which turned out to be the welcome party for guests, to the bohemian-inspired Vera Wang bridal dress that was just Anne's outfit for the pre-wedding celebration, the public back home monitored all the happenings in Queenstown, New Zealand. On the day of her wedding, November 12, the bride stepped out in a custom Monique Lhuillier gown. Anne looked every inch a goddess in a ball gown with layers of tulle, organza, and lace, a plunging sweetheart neckline, and sheer long sleeves that the bride removed during the reception. The elegant dress also had a cathedral-length train and hand-appliqué lace veil.